As Abraham did for Sarah, and as Jacob did for Rachel, so it is for modern Jews to follow the Patriarchs’ examples in burying and honoring the dead. Shortly after the first Jewish settlers joined in San Francisco’s Gold Rush era, they purchased land for a cemetery on Vallejo Street. In 1860, Congregation Emanu-El dedicated its second cemetery in the area that is now Dolores Park. When San Francisco’s booming growth encouraged relocation outside the city, Congregation Emanu-El dedicated Home of Peace Cemetery in Colma in January 1889. 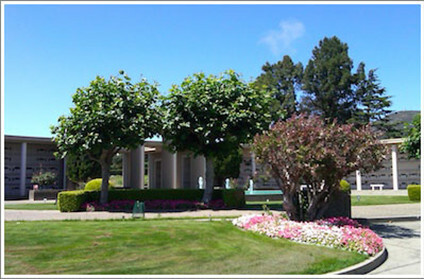 Home of Peace consists of twenty acres of graciously landscaped gardens at the foot of the San Bruno Mountains. The grounds and mausoleums are respectfully maintained under endowed care. Fresh flower placements and grave ornamentation plantings add to the dignified beauty and serenity of the cemetery. Home of Peace offers the Jewish community the choice of traditional ground burial, as well as above ground entombments in two mausoleums. Prior to constructing the Home of Peace mausoleum, private family mausoleums were the only options for above ground entombments and inurnments. The indoor mausoleum’s red tiled dome, marble interior and torpedo-globed chandeliers evoke design elements of Congregation Emanu-El’s beautiful building at Lake Street and Arguello Boulevard in San Francisco, which in turn is reminiscent of the Hagia Sophia in Istanbul, Turkey. The Home of Peace mausoleum opened in 1935. Several decades later, the Garden of Peace outdoor mausoleum was constructed. Both mausoleums offer crypt entombment and inurnment in niches. 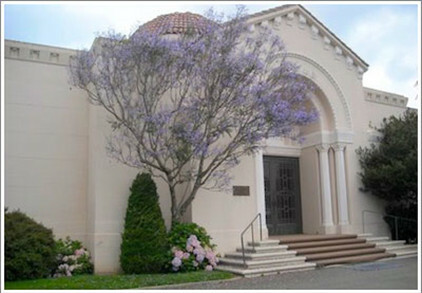 Home of Peace Cemetery has designated sections for two Bay Area synagogues: Congregation Beth Sholom (San Francisco) and Peninsula Temple Sholom (Burlingame).